With many many years under his belt designing apparel for women that truly makes them look their best in a wide range of settings, Michael Kors has made quite a name for himself in the highly competitive world of womens wear. That industry is definitely not one for a person with weak resolve. Today you might be hot, but tomorrow nobody’s heard of you. Considering how fickle the womens wear fashion scene is, it is no small feat for Michael Kors to remain a durable brand. 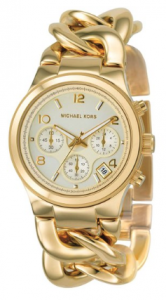 Just as Michael Kors conquered womens wear, his watch pieces are sure to turn heads. Most of all, his watches are sure to remind people why Michael Kors is such a respected name in fashion. You see, what separates the Michael Kors MK3131 Women’s Watch and his other time piece is the fact that Michael Kors knows all about proper accessorizing. Accessories are supposed to be fashion team players. They don’t hog the spotlight. Instead, they make the team look good. And this philosophy is in full beautiful and dazzling display with the Michael Kors MK3131. Mixing high design, luxury appeal, and sporty accents, the MK3131 does it all without looking like it bit off more than it can chew. This watch’s great mix of luxury, sports and outdoor accents is well put together. It doesn’t look forced. It doesn’t look contrived. There’s none of the awkward vibes sent out by a standard watch design slathered in crystals and gold. Instead, this time piece is almost subdued and sedate. It radiates a cool sort of calm confidence. It doesn’t have to boast-it has already arrived. Thanks to Japanese quart technology, you don’t have to wind up this watch to keep it going. Also, you don’t have to worry about replacing batteries every few months. If there are three words to describe Japanese quartz technology, expect it to be durable, long-lasting, and reliable. That is the Japanese difference. Not surprisingly, there is a set-it-and-forget vibe you get with this timepiece that sets you at ease. This mindset matches the soft understated elegance this watch’s color and band design bring to the table. Thanks to its luminous feature, you can use this watch at night and know what time it is. Also, don’t get the wrong impression that you can only wear this piece indoors. No, no, no. The Michael Kors MK3131 is actually quite sporty and you can wear it in all sorts of outdoor settings thanks to its chronograph and stopwatch features. The MK3131 is a great timepiece for a woman that is not only on the go but also confident, ambitious, comfortable in her skin, and unafraid to handle any situation. Confident, calm, collected, yet capable, you simply can’t go wrong with this Michael Kors product. After all, it embodies his tried and proven accessory design philosophy of accentuating your personality and presenting you as a complete package.